DTRPG is still acting screwing for me. No pop up with system information when I hover over a title, previews take me back to the main page. I dunno if it's me or what, they've never liked my internet. Dragonlance Classics Volume 1 - I think this was always up, just now available in print. Monsters of Mayhem #1 - Presumably this collects the monsters (and art) from the first few Maximum Mayhem Dungeon modules. 36 pages< $10. Black Pudding #4 - JV West's neat 'zine for LL Probably one of the funnest OSR product lines around. PWYW, 24 pages. Free 1st Edition Style Character Sheets - Maximum Mayhem style. 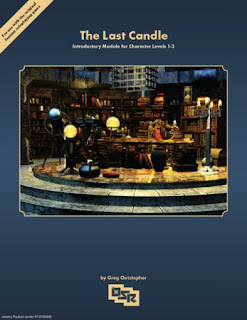 The Last Candle from Chubby Funster is part mini-setting, part dungeon. Unlike most such things that have something of a generic but vaguely English medieval/fantasy theme, this one has a French flavor, reminding me of Clark Ashton Smith's Averoigne (which of course was used for X2 Castle Amber) and C.L. Moore's Jirel of Joiry. The Gardens of Ynn - A "point crawl" involving a weird garden. Basically LofFP style artsy gibberish - random table and such, not a keyed adventure or anything. Still, at $3 and 79 pages, it's not particularly expensive gibberish. Looks like the new version of TORG is out. I remember buying the original boxed set back in the day, but the game seemed designed to sell splatbooks, one for each cosm or whatever its called. The World of Greyhawk (Folio) - To me, the best part of this was and is the map. I think it's always been up as PDF, but now has a POD option. Dunno if that's just for the folio or the map. Quests of Doom 4: In the Time of Shardfall - This might actually be good since it's by Michael Curtis. Still, $7.99 for 28 pages is out of my price range and it sounds sorta video-gamey (find 5 shards and destroy them, then kill the boss). Quests of Doom 4: Pictures at an Exhibition - I will be very disappointed if there's no Tarkus in this. Actually seems to be a real world adventure. $7.99 and 32 pages. He's an odd person, but he's one of us, so if you can spare anything, it would be helpful.